It’s the season of graduations, and Jason Mraz just released the perfect song to accompany every single one of them. I played it yesterday as my 4th graders were working on mandalas, and they left the classroom singing the chorus in unison on the way to lunch. The song, “Have it All,” is one of those catchy tunes that you don’t have to be a music producer to predict will be an instant hit. It will lift your heart even more when you watch the video. Students from Binford Middle School in Richmond, VA, (where Mraz has mentored since last year) appear in segments of this uplifting short film. The custodian gets a starring role, too! Jason Mraz is a master of lyrics, and your students may enjoy analyzing such lines as, “May you be as fascinating as the slap bracelet.” My favorite is the one I used to title this blog post. For more inspiration for the students who are embarking on new chapters in their lives, you may want to check out this collection of videos I posted last year. I also have a list of books that make great graduation gifts. Day 2 of this year’s standardized testing, so I’m posting a few more amazing feats that defy measurement on any state-mandated tests. You can see Day 1 here. Today’s Frivolous Friday post is in honor of my colleague, Angela Leonhardt, who is a music educator extraordinaire. She just made it to the finals for our district’s Teacher of the Year. That honor and many more are well-deserved by this wonderful teacher, who enriches our community with her dedication. If I had any music composition skills, I would play her a magnificent fanfare with this A.I. Duet experiment from Google. Unfortunately, even A.I. can’t mask my ineptitude, but I’m sure that someone with Angela’s talent can find a way to make beautiful music with this fun tool. H/T to Mental Floss for sharing A.I. Duet with its readers. Musicmap is an incredible interactive website project by Kwinten Crauwels, which endeavors to offer an encyclopedic collection of music genres and their histories. When you first visit the site, you will probably be familiar with most of the titles on the home page. 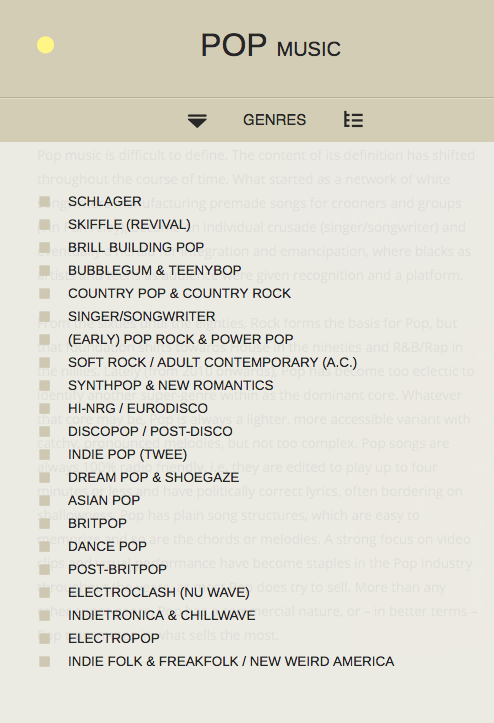 Click on any type of music, however, and you will be able to access many genres that, if they ever crossed the thresh-hold of your eardrums, you would be hard-pressed to identify their names. Pop music, for example, offered up “Brill Building” and “Shoegaze,” two genres that sound more like commercials for men’s products to me than musical categories. In case I had any doubt these existed, though, all I had to do was click on either one to get a definition, time context, and a suggested playlist of examples. I can’t attest to the accuracy or reliability of Musicmap, but I certainly can recommend it to anyone with an interest in the history of music and in learning more about its extensive diversity. Thinkfun periodically sends products to me for review. When Compose Yourself arrived on my doorstep, I knew that I should find someone with a musical background to give it a test drive. Our school music teacher, who is also the President-Elect for the Texas Music Educator’s conference, volunteered to try out the game with her class. Here is Angela Leonhardt’s review. 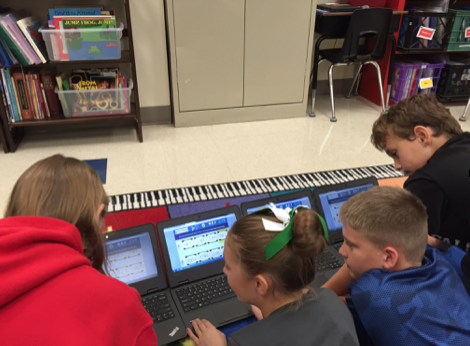 “I was recently asked by our GT teacher to test out this music-based game from Thinkfun. What fun my students and I had being the testers! Although we were using this in our music classroom, anyone who loves music would enjoy this activity. With 60 different music cards the possibilities for musical enjoyment are almost endless. 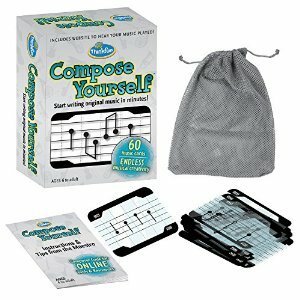 How it works: Once you have signed into the Thinkfun Compose Yourself website and entered the “make music” code provided with the cards you are set to start composing your own music. Each card has a 4 digit number code that you enter. You can enter up-to 16 cards in your composition. Once you are done you can hear your composition played by a professional marimba player, orchestra or both. Very easy to use. 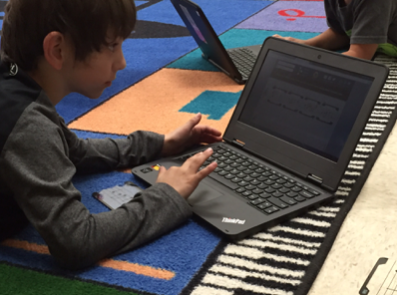 Students in 1st – 5th grade easily used the website and cards with minimal instruction from me. All of the students enjoyed the music making experience and were disappointed when our time was done. A good sign in my book. The students were very excited to hear their finished products. One group of students wanted to continue the experiment and see what it would sound like if they all played at the same time. Price: Reasonable for both teachers and families. We loved the ‘Clear Composition’ feature at the bottom of the screen to quickly set up a new composition. Of course the Free Set-Up of your account is also a big plus. I set up one teacher account for all of my students to use. Bonus: You can download the mp3 of your composition and the printed melody line. For those music educators out there who are wondering how this relates to your classroom instruction and standards, never fear. My initial purpose was to have students ‘play’ with the ideas. As an Orff Schulwerk teacher the act of play is where the learning begins for me. I gave my students a quick overview of how to enter the card codes and told them to play, see what happens. What happens if you flip a card or move it to a different place in the score? They LOVED hearing their compositions in an orchestral setting. It was very satisfying to them. With our second experience I provided more structure to their play by turning this into a lesson on musical form and elemental structures. What started as play turned into learning through play. I can also see future lessons on melodic contour using Compose Yourself. I don’t see my class using this as a ‘notation reading’ lesson at this point. I could separate out the cards within their reading ability but I think there are other ways to practice this skill. I’m not a fan of the ‘lollipop’ notes as we call them in my classroom but I’m sure there was a technical reason why the programmers printed the notation this way. This is a small minus for an overall great program and experience for my students. 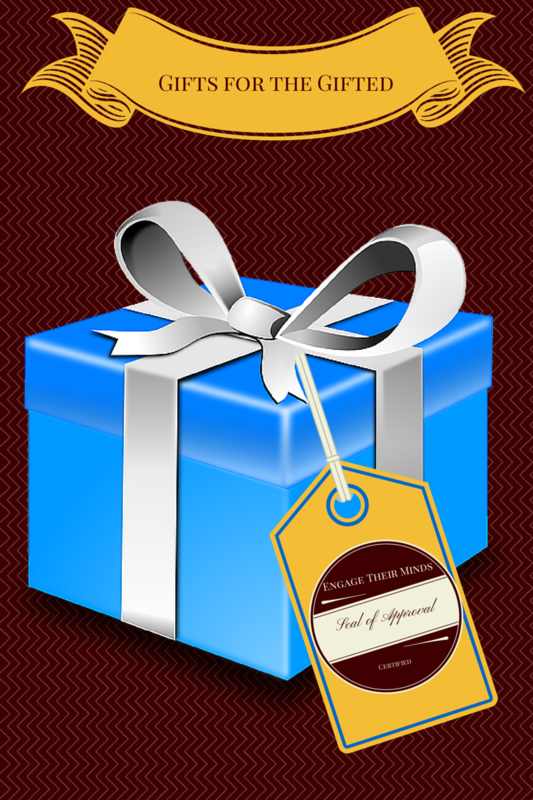 For more recommendation in the Gifts for the Gifted series from this year and past years, check out this page. Typatone comes from the makers of Patatap. In the latter, you are basically able to create visual fireworks by typing on a keyboard, as each key corresponds to a shape and sound. Typatone is similar, but it allows you to create music with a sentence. How can you use this in class? We discuss synesthesia in my 4th grade GT class, so Typatone can definitely augment that discussion. Also, I think the students would enjoy writing poetry or sentences with figurative language to see how they sound. How about a spelling test? Allow students to listen to the sounds of different letters, and then have them guess what word you just spelled. Music teachers can probably think of a few applications also. Creations can be shared through e-mail or embedding (although the embedding option apparently does not work in this blog). You can click here to listen to the short tune I composed.